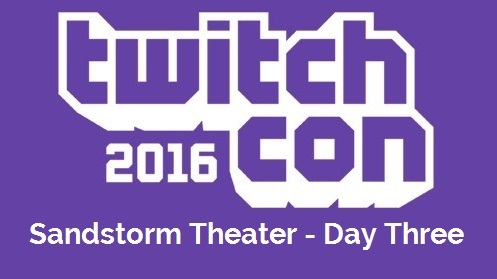 For the complete list of panels, check out the main TwitchCon 2016 panel recap post. VoD starts a bit into the panel so some info/content may be missing off the very beginning. What has been your mindset of setting up your stream tech-wise? Plan to upgrade to capture card but using iOS so far. Uses a program called Airserver + OBS. Simple and cheap compared to a capture card. That being said, Android has many avenues of streaming directly from phone. Used a hosting service to stream Pokemon GO. Primarily uses iOS but the hosting service was Android. The hosting service requires a lot of trust as the owner has complete control over the device. If you want to jump in right off the bat on iOS, Airserver is the way to go. The thing to keep in mind is when using software over a capture card is that you’re using your computer’s CPU. When it comes to mobile streaming with capture card, especially iOS, you have to watch out for HDCP protection. This is where you can’t send the screen to your device if it’s enabled on the capture card. Get a cap card that doesn’t have HDCP protection. Went through the original Elgato, then the ElgatoHD60 and is looking forward to HD60S. Magewell has great devices that capture 60FPS. If on the road, Android is the way to go. Nvidia SHIELD is great for mobile streaming. Adds that Avermedia has 60FPS capture cards. They have HDCP protection but you can get around it with an HDMI splitter. Airserver is good with a solid WIFI connection. If you don’t have a good connection, you’re better off with a capture card. If using iOS, you can use a Lightning cable to hook up to iPhone/Tablet and mirror the screen with Quicktime which you can then capture with OBS or whatever encoding software you want. Need something like WavTap though to stream the audio. Community has many great overlays to fix resolution issues to make it not noticeable you’re streaming from a mobile device. What games do you see trending in mobile streaming? What’s successful right now? Vain Glory is main area of expertise. First game that gives the competitive feel to mobile gaming. Lots of new games that are following the same template. Mayhem is a 2D Contra style game. Multi-directional and leveling. Able to play against AI bots. Just because a game doesn’t look great to you, doesn’t mean it won’t be extremely fun with friends. Small casters have a chance to excel in mobile gaming and push it. Mobile is an emerging market. Was partnered through mobile streaming like PhallOfPhariss. Vain Glory is doing well. Super Senso is a turn based strategy game for iOS/Android that’s in beta. Excited about a new game/app that’s being Kickstarted called Night Terrors. Horror Augmented Reality game. Had fun trolling his audience with it. There’s many options out there for mobile streaming. Untapped market. Excited to see the growth of mobile streaming. It’s in its infancy right now. Tons of developers creating things for the mobile market right now. Tons of free games out there. Everyone has a phone so the chance of viewers trying out whatever your streaming is high. Good interactivity and engagement with your community. How easy it is to manage devices/apps in mobile streaming/gaming? For Pokemon GO used two devices. Highly recommend Teradek products. Not only for gaming, but things like cooking shows. The app for iOS is free. Different app for Android but has a similar use. Check out the DJI Osmo for a product that can face track. Great for cooking shows or other similar shows. Can stream natively right to Twitch. High end version $699. The DJI Osmo Mobile that uses your phone for the camera is $299. Vain Glory can play at 1080 60FPS. Looks great and plays great. It’s the start of something big. The accessibility of mobile devices makes it much easier to manage things. For example, bringing people together for a Hearthstone tournament is much easier with mobile devices as opposed to whole PCs. Companies/publishers like Tellatel/TinyBuild are doing more mobile related things like bringing their PC titles over to the mobile market. How important is it as a mobile streamer to reach out to companies that work or create products in this area? At Vain Glory, they set up live community meetups. It’s one of the great things about mobile. Tries to set these kinds of things up as much as possible. Great to work with streamers. It’s a close relationship. Can feature in-app or on social media. Starting to work with a mobile developer can be extremely helpful to a channel. Ask to be featured if you can. Gets 200-500 viewer boost when featured in-app on Vain Glory. Talk about the game more and be positive about it. Don’t use microtransactions as a way to get noticed. Big eSports organizations are getting into the mobile scene (ie. Vain Glory). What do think of mobile gaming in the professional scene? Before Vain Glory, was very PC based. Mobile gaming has a stigma over it. Big eSports orgs such as TSM moving into Vain Glory validates mobile gaming in a way. Before joining Super Evil Megacorp (Vain Glory devs), was skeptical of most mobile products. Didn’t realize a phone could produce such high quality. One of the great things about mobile gaming and eSports is that it’s still new and developing. No correct way to do it which made it nice for them to create a scene their way. What are your best tips for anyone trying to get into mobile streaming? Have a good data plan! You WILL be using lots. Best go Unlimited. Agrees with theReal_McCoy. He did 24Gigs over two weeks on Pokemon GO. Phone bill was almost $500. ElgatoHD60S is best bang for buck capture card if using PC with mobile streaming. Don’t break the bank. Many options out there to jump into mobile streaming. If already set up for streaming on PC, things like Airservers and Capture cards make it easy. Agrees on the data plan. Be careful and have a good WiFi connection if you’re more mobile. Webcam placement on sides is generally better since your head will likely be looking down as a mobile streamer. Place your camera by your device. Interaction is huge. Don’t lose track of your community. Fair use has several tests: 1) Are you hurting the copyright owner in any way by using their content? 2) Are you profiting from the use of their content? 3) Have you not significantly altered the content before using it? FTC (Federal Trade Commission) has been cracking down on how advertising is done online. Certain things may need to be disclosed. ScholarsPlay streams on a weekly basis where they play different games and analyze them live on the fly doing academic style criticism, often without having played the game. The difference between a review and criticism is that criticism is less about providing a general opinion but more about finding tools to understand something. This will allow you to understand a game better instead of stating your opinion. You don’t boil a game down to a rating but to understand how even a bad game can for instance teach you things. A review is focused on saying something is good or bad whereas with criticism you try not to. The difficulty of streaming criticism on Twitch is that often you haven’t played the game before. You provide criticism on the fly and therefore your first insight into the game might be wrong. Criticism is about providing arguments, when it is written you only see the end product but not the process, when it is streamed you can see the whole process, end result included. Important part of the criticism process is people disagreeing and you trying to resolve it, when you stream this there’s a chat full of people potentially disagreeing with you. It is important to not tell people in chat that they’re wrong, you want them to engage with you and telling them they’re wrong is making it less likely they will want to. Moderators help with this, they can highlight the important questions and stimulate discussion. Criticism is communal, heaving chat heavily moderated does not stimulate all the different points of view people could have. So it is important to find a balance in how you mod your chat. The goal of a criticism stream is not necessarily to be entertaining like most other streamers. That doesn’t mean a critical stream can’t be fun. Important things happening in-game can lead to 15 minute long discussions where the game is not really played, but you just talk with your chat. This is different for normal streams where this usually gets less attention. You need to find a balance between talking about what’s happening in the game and letting the game do the talking for you. You don’t always need to analyze everything you do. ScholarsPlay tries to be educational but at the same time also tries to be entertaining. They do this by being playful and showing the things they talk about instead of just talking. It’s important for game developers to play games in a critical manner, so they can find out what works and doesn’t work for an audience. It’s important to get a good balance between different types and genres of games, so you can keep your arguments fresh and don’t repeat the same ones for every games. It’s also interesting to see what argument can be used for these different games. It helps to have a list of links to sources that have already reviewed or critiqued a game that you can fall back on and can agree or disagree with. It varies a lot between games what kind of new audience you get, for AAA games most of the chat has played the game and come with their opinions. With indie games people tend to be a bit more open to your arguments because they haven’t played the game yet. Sometimes we eat just because to fill time. Try putting out fruits, like apples, and when you feel like you need to eat, look at the apples. If you are really hungry, you will eat the apple, if you don’t want the apple, you probably aren’t really hungry! How do you ensure constant, consistent coverage for the stream? Communication within the team is huge! What is your process for finding moderators? Not using an application, but picking those who are helpful within the community. Be careful with stream friends. Moderating changes the relationship. Look for those with thick skin. How have the new moderation tools helped you and your community? The pop-up for chat rules forces new viewers to click a button to continue, allowing everyone to be aware of how to conduct themselves in the channel. Overall feelings about the new tools are pretty evenly spread. How do you keep up with the erratic schedule of a Community Manager? What devices do you use to keep yourself in touch when you’re away from the stream? You need to fit the role and lifestyle of someone who needs to be in constant contact with others. Accepting that is important. A cell phone with apps is your lifeline. Discord, Slack, etc. Wireless headsets are huge for multitasking. They allow you to step away for other tasks while still hearing when you’re needed. Sometimes it means not having a personal life. Keeping up with the erratic schedule is easier when you are helping support someone’s dreams. Building a community from the ground up, or maintaining an existing one. What does it take? Adapting to what your community wants. Allowing for sponsorships. If building from the ground up, you should take time to plan what you would like your stream to be. Figure out your target audience and also on the other side of it, who is not welcome. Figure out how to politely uninvite people from your community that may be toxic. Building a community can be slow, but knowing what you want from it ahead of time is everything. Streamers needs to work with moderators to communicate ideals in order to keep things on track. Moderators need to embody what the streamer wants the environment to be. You want the community to be genuine. Everyone needs to respect each other. It is important to tell those who are disrespectful that they’re not welcome. What are some mistakes you’ve made or overall things you’ve learned? HiItsBrant: Learning to talk things out. Figuring out the reasons for why mistakes have happened. Working with the age gap and knowing that some people don’t understand the rules based on different levels of maturity. Giving warnings and understanding. GollyMsMollie: Being flexible. The instinct is black and white, but you have to recognize that people don’t work that way. Part of being a Community Manager is loving people and learning to work with them. Keep things positive but be flexible (especially with profanity) so it broadens your audience. xNikkiB: Not recognizing that it’s more of a family that you’re building. Knowing who is right for your family and who isn’t, is important. EffigySR: Change isn’t always bad but you should always be cautious of it. Sometimes you need to change to grow so don’t be afraid of it. Lucky_Misfit: Learning how to delegate was a huge issue for me. Keeping all the tasks to myself was horrible and almost resulted in me being burnt out. It is huge and a lifesaver. How can you tell if you need a Community Manager vs a Business Manager? When you get to a larger size, having one of each is beneficial. When you’re at a smaller size, having someone who can do both works well. Having someone reaching out to devs, getting keys, handling emails, and going to conventions is beneficial. If you’re starting out in the viewer size of 0-300, you probably need just a community manager to start. Being that smaller size lessens promotional offers so it’s easier to manage. A benefit of having the roles separated is that a Business Manager can separate themselves from thinking about things in a personal manner. You need a brand that people can market before looking for a Business Manager. Community management can help kickstart that. If you don’t have a Community Manager, you most likely do not need a Business Manager. They’re like stepping stones. Closing thoughts or advice to give to people? HiItsBrant: If you’re looking to become a Community Manager, do it because this is something you are very passionate about. GollyMsMollie: Have really, really thick skin. You have to really like people. Also, don’t go seeking this position. One thing I would say is find something organically where you want to be there every day. It grows that way and it’s where you can find your roots. xNikkiB: You’re always gonna learn something new. You’re always gonna come across something that you’ve never done before and you get so overwhelmed. It’s good to have a support system with other Community Managers. Don’t be afraid to take risks and learn something new. EffigySR: Work with your streamer to know what community you want to build and stick with that. Lucky_Misfit: If you like being really chaotically busy, you like having a challenge, and you like helping people, do it. Do it with all of the might in your soul and in your heart! RawrSnacks: Find people who are also in Community Management and network them. How should you run mod meetings? What are the best things to talk about? Take notes throughout the week of things that you’re not satisfied with. Think about what you’d like to change and what isn’t the overall feel you want for the stream. Look at it like past, present, and future. Talk about what went wrong in the past, what’s currently going on, and then what you’d like to happen in the future. Mod group Discord channel and an announcement channel can be a good alternative to having meetings. Allows constant and immediate communication. How do you go from community member or moderator to community manager? Take the initiative. Take the extra step to be there to help out. The more you help people out, the more they’ll realize that they can rely on you. Eventually it can result in having an official title. Ellohime: As a streamer how can I better communicate with my Community Manager and moderators? Be mindful of one word answers and the length of time you take to respond to messages. Make sure that everyone is on the same page and be mindful of communication. Be detailed in your communication. The more specific you can be of your desires, the better your Community Manager can make it happen.